1. Go for matching double-line bands. 2. Or say it with the date. 3. Put your trust in triangles. 4. Keep it simple with black bands. 5. Unite as one with an ampersand. 6. 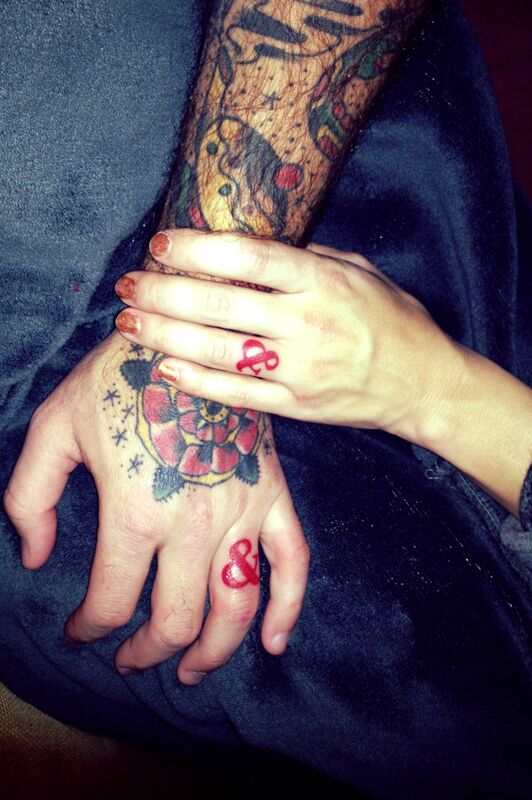 Mark your new partnership with "Mr." and "Mrs." tattoos. 7. Show that you're each other's life line. 8. Do the totally nautical thing. 10. Or each other's names. 11. Shower each other in "diamonds." 12. Mark each other for life. 13. Do your wedding date in Roman numerals. 14. Get matching anchors, because duh, that old metaphor. 15. Or go for ones that show your shared love of Harry Potter. 16. Get super cool complimentary designs. 17. And maybe do it in color. 18. Say how you're really feeling. 19. Try matching Celtic bands. 20. Or bands that ensure that you're always going in the right direction. 21. Go for these super awesome Star Wars-themed tats. 22. Don't forget the luck of the Irish. 23. Signify that your love is to infinity (and, of course, beyond). 24. Do it subtly in white ink. 25. Pokemon the pair of you. 26. Commemorate where you met and fell in lurve. In this case, Sun Valley, Idaho. 27. Cherish your partner — and Peter Pan. Click here for the full story behind the tattoo. 28. Pair your bands with pretty dot work. 29. Or share your hearts with one another. 30. Keep your love under lock and key. 31. Or simply tie it to your finger. 32. Scrawl forever in your native language. (In this case, Hebrew). That tat says "I am my beloved's and my beloved is mine." 33. Combine the special date and the symbol of your love. And know that no matter what, you've found your special someone.